With an entire year to immerse my soul in the domestic arts ahead of me, I've been meaning to fill my diary with all my 'home-centred' ideas so I don't forget them, but...I keep forgetting to write them down. Do you find yourself doing that? A great idea (or three!) comes to mind and you plan to follow through but are remiss in making a note of it, so pretty soon you've forgotten what it was? The story of my life. Another thing that stalls my good intentions for bringing some domestic control to my home is feeling overwhelmed by the amount of work I see before me and simply not knowing where to begin. 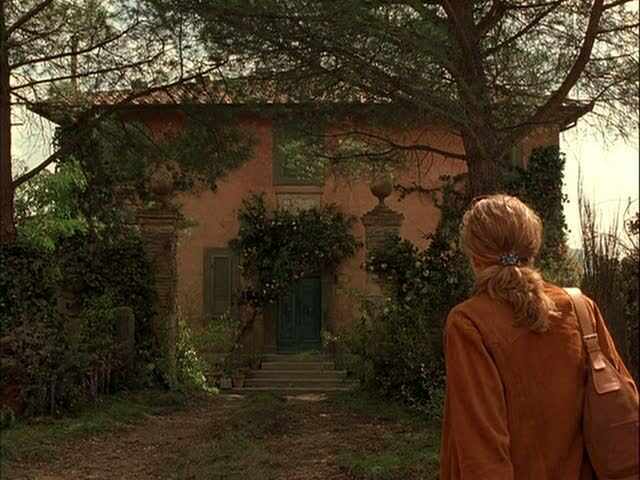 As I was walking through each room around New Year my memory was jogged by a scene from one of mine and Blossom's favourite lazy day chick flicks - "Under the Tuscan Sun". "Pick one room and make it yours. Go slowly through the house. Be polite, introduce yourself so it can introduce itself to you." ...to create a home from the rubble. Even though I am not renovating a neglected Tuscan villa, I do desire to make every room in this rental house a place of 'welcome' and refreshment, a sanctuary even, so I decided Frances had sage advice for me to draw from this year. One room at a time, politely re-acquainting myself with it's nuances, writing myself notes about the things I need, and want, to do with it to fulfil my vision. That's when my phrase "Walk The Room" was birthed. As you would have noticed, I've been in my kitchen a lot this month. 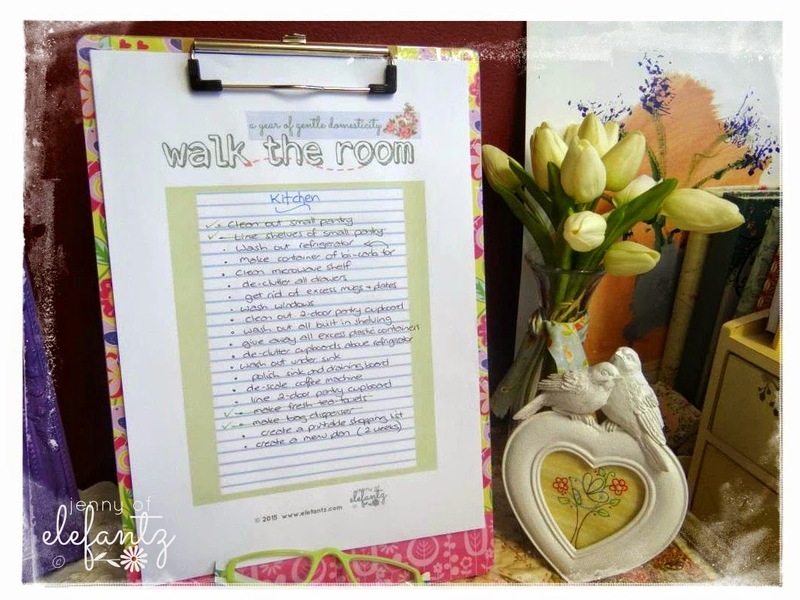 ...but each 'walk the room' list is just as important as another. I will spend my Sunday afternoons reading through each room's plans and decide what I'd like to accomplish over the following week. I'm sure I'll add to each list along the way, but I'll also be crossing things off them. I envisage a lot of satisfied smiles over early evening cups of tea in the months ahead as this house becomes a 'home'. 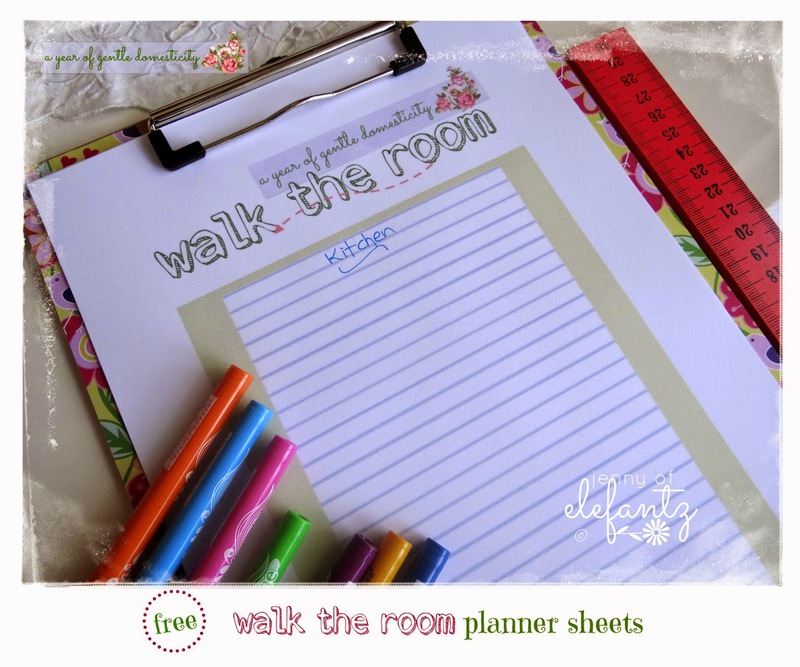 If you'd like to 'walk the room' in your home too, you can download my free printable planning sheets HERE. They're not fancy, because this year is about simple. 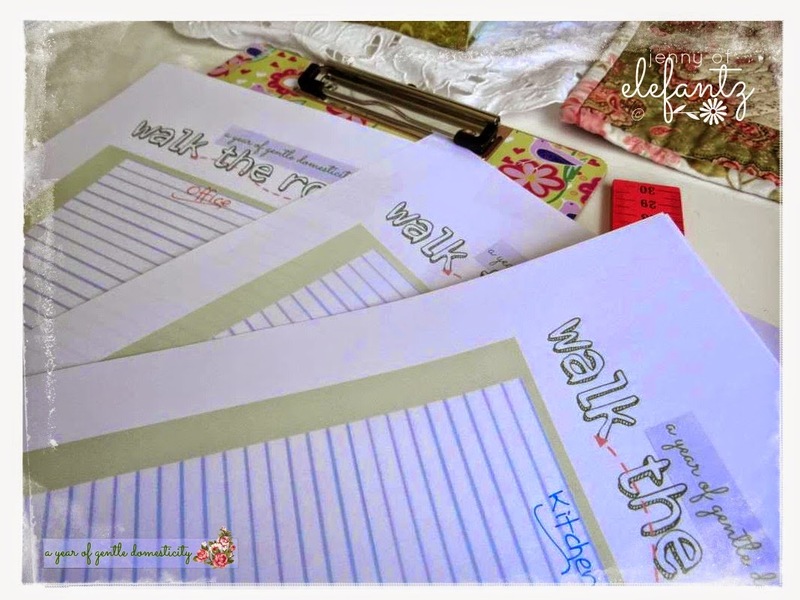 I'm still loving the journey through a life of gentle domesticity and decided to update my "Walk the Room" downloadable sheets for you. Download the NEW printable sheets here or here. Thank you for sharing your thoughts and plans. I've done this in the past, not that I've followed through, but I have a plan - in writing. It definitely helps me to stay focused. The movie is one of my favorites as well, for all the same reasons. The countryside is beautiful, the relationships between neighbors to be treasured, the house takes my breath away - even at its most neglected :) I would love to visit Tuscany someday - it just calls to us, doesn't it? Clean and tidied the craft room yesterday.....that will do for me, but you have inspired me to watch the movie. It's one of my favourites. Thanks for sharing the sheet you made with us. My daughter and I have been putting our house back in order after some remodeling. I definitely will be able to use this sheet as I've had a desire not just to organize some rooms better, but also to decorate and make my home more homey. One step at a time, and we will meet our goal. Without knowing I have been doing just this...walking my rooms. I feel like I have neglected my spaces and merely been "shoving stuff" into corners and closets. I just spent an entire Saturday tackling my sewing room. I chose to begin with the big fully stuffed closet. Wow! I found things I even forgot about and filled our largest recycle bin. Gathered more for donation and finally another day (tomorrow?) I shall tackle the piles on all horizontal surfaces. 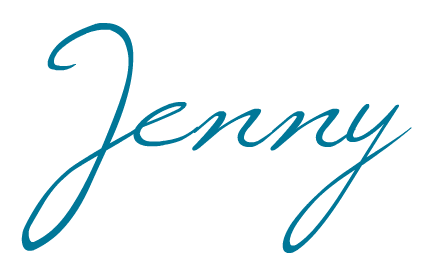 Jenny you are truly an inspiration and I shall begin to make lists. 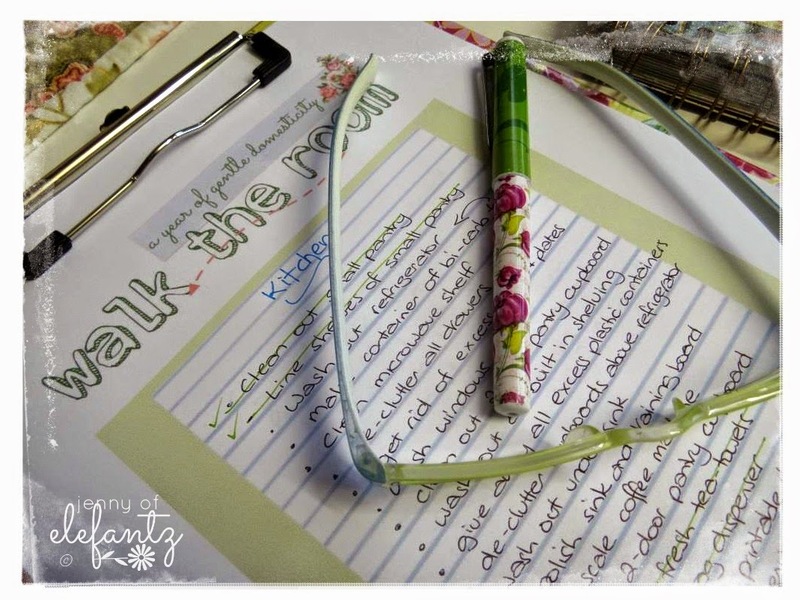 Love this sheet - so much nicer than the printer paper we usually use to write out lists on. Lovely! My eldest daughter just moved up north to Brisbane so Im finally about to get my sewing room, but I have to clean it out and move it around first.... I started tonight. Then i read your blog! will print some sheets out and sit in her room tomorrow after work and plot :) thanks! Dear Jesus, pour Your sweet Spirit into April...cover her with Your perfect love. Fill every empty space, and guide her forward, gently but surely. Hear her prayers, and answer her as only you can, Lord. I am walking along with you all the way this year. My walking is said figuratively though as I have been in a wheelchair since 2007. That was the last time that any thing was really done around my home also. I have been in such severe debilitating pain since 2007 that I have not even been able to keep up with the basic housekeeping chores. I have watched my house turn into a cluttered mess, with two rooms that just have paths. It has been depressing to watch happening, as projects I wanted to do but was no longer able to got piled higher and higher. My husband who had been laid off from a job of 25 years had just been hired after 1 1/2 years of desperate looking at a job at a 1/4 of his previous pay, less than he had made from un-employment. While he was deeply grateful to even have a job, trying to pay the mortgage, buy groceries, pay taxes and the rest of the bills with what he was now making was overwhelming. He soon became depressed. My health had never been good but now with the pain, we were going to pain doctors looking for anything that might help alleviate it even some. Even though we had insurance the out of pocket and prescription drug charges added to the monthly drain on the already overly stretched budget. When you are in so much pain that your doctor tells you to use a wheelchair so that the quality of your life will improve it has to be bad. When every day that comes around the pain is worse than the day before and 20 years ago you didn't think you could handle it any worse, it's pretty bad. But in November my pain doctor decided that at my age it didn't really matter if she added another narcotic to my regime AND I AGREED to take it. I've always been so afraid of narcotics, she really had to convince me to take the first one. On Christmas day I made our entire family meal completely by myself. I haven't made a meal without help in years. Then I made a special meal by myself. The second narcotic had begun to build up in my system and I was able to do things on my own. It was this side of miraculous. Since Christmas day I have been chipping away at piles. I have been CLEANING. I have been TOSSING and ORGANIZING. It has all been too wonderful. I imagine it will take me at least a year to get my house back into order but it took 8 years for it to get to where it is now, so I can't expect an overnight fix. At night when I go to bed my dear husband has to put prescription pain relief patches on my back or I can't sleep. I am just thanking Abba that that pain came from work. I am sill in pain from the many diseases I have that cause it. Now though, I have a life besides just a haze of pain. I am still in a wheelchair but it is amazing what one can accomplish in one. By being in one I cut my pain down so that I have energy to expend on other things. This week I will roll through the house and look at each room and see what I want to accomplish this year. I will print out your list, I love it. Abba answered a prayer last November when my doctor added the new med. My life has been handed back to me. I can really see this house now. It's time for a Year Of Domesticity. I'm ready to "walk" this year with you Jenny!